Have you searched for ‘hire mobile scaffold tower’? If so, give Franks Maintenance Group Ltd a call today on 01747 826656 and let us devise a scaffolding solution to suit your building requirements. With many years of experience, we have a wealth of knowledge when it comes to erecting scaffolding. Not only is our mobile scaffold tower hire the most cost-effective, but it is also the safest option around. Whether you’re re-doing your fascias and soffits or carrying out an interior fit-out; make sure you choose to hire mobile scaffold tower systems from Franks Maintenance Group Ltd. While using a ladder might seem like the cheaper option, it could also go disastrously wrong leaving you seriously injured or worse. As the safer choice by far, our scaffolding will provide you with the best setup while working at height. So, if you’re looking to hire mobile scaffold tower systems but unsure as to who to choose, give us a call now. To learn more about our services and what we can do for you, please see below. What can Franks Maintenance Group Ltd do for you? What Franks Maintenance Group Ltd can do for you is supply you with high-quality mobile scaffold tower hire at competitive rates. Our tower systems are the most reliable choice and are perfect for all manner of working environments, from private residences to commercial sites. Hire mobile scaffold tower systems from us, and you’ll receive a full consultation and quotation service guaranteed to meet your needs. Our mobile scaffold tower hire professionals carefully design every system to fit properties of all shapes and sizes. With multiple configurations available, these robust and sturdy systems are the safest and most versatile option around. We use towers constructed from the highest quality metal and platforms comprised of the finest timber. So, you can be confident knowing that you have chosen to hire mobile scaffold tower systems that are the best around. What are the benefits of choosing mobile tower scaffolding? By opting to hire mobile scaffold tower systems from Franks Maintenance Group Ltd, you will be having a knock on effect in boosting the productivity of your team. The sturdy design is made safer by the inclusion of a platform enclosed by a securely fastened guard rail that extends all the way around. This means that your team won’t have to worry about their safety leaving them free to focus on the task at hand. Furthermore, mobile scaffold tower hire allows you to comfortably reach all of those hard-to-reach areas ensuring that the job is done correctly. Despite being smaller than conventional scaffolding, tower systems provide the user with a generous amount of surface area atop the main timber platform. With guard rails to keep you from falling, you’ll have ample space in which to work when you choose Franks Maintenance Group Ltd to hire mobile scaffold tower systems from. On top of being highly durable, our mobile scaffold tower hire setups are also lightweight. This makes moving them incredibly easy and straightforward reducing the time it takes to dismantle, switch location and get everything setup again. Plus, the addition of wheels means that the scaffolding can be quickly pulled or pushed to a new location with minimal fuss. If safety is a key concern, then you definitely need to hire mobile scaffold tower systems from Franks Maintenance Group Ltd. As mentioned above, our systems are comprised of premium-grade materials that guarantee impressive durability. The timber platforms feature an engineered construction, and the addition of a guard rail makes the chance of falling non-existent. So, if you’re interested in our mobile scaffold tower hire services and have any questions, feel free to get in touch with our team now. What makes us the best choice to hire mobile scaffold tower systems from? You wouldn’t cross the road without looking so why take chances with your safety when carrying out work inside or outside your property? Here at Franks Maintenance Group Ltd, we are widely regarded as one of the foremost choices for those looking to hire mobile scaffold tower systems that are both reliable and affordable. As members of the FMB, you can be confident in the level of quality that we provide as well as our prices which are among the most competitive around. Here at Franks Maintenance Group Ltd, we also boast the shortest lead times on all work carried out by us. From the moment you enlist our services, you can expect work to be completed to your schedule and within the confines of your budget. So, if you’re looking for highly competitive mobile scaffold tower hire delivered by a friendly and knowledgeable team of professionals, look no further than Franks Maintenance Group Ltd. 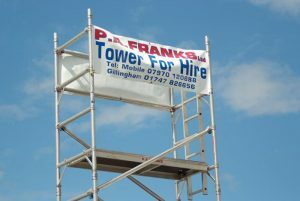 Hire mobile scaffold tower systems by calling Franks Maintenance Group Ltd today on 01747 826656. Alternatively, for all general enquiries, be sure to get in touch by dropping as email at info@franksgroup.co.uk.